We are amongst the most reputed names in the industry, offering Rail Thermometers. Due to our widespread industry experience and insightful market understanding, our firm is engrossed in providing a wide gamut of Rail Thermometer to our precious customers. In order to meet the changing and ever increasing needs and demands of our customers, we provide this array in a variety of sizes and specifications. With our rich industry knowledge, we are engaged in offering wide range of Rail Thermometer for Rail Cars. Our offered product is highly in demand for its fine finish and flawless performance. Rail Thermometer Model No RRT1020: Pocket size and time tested rugged thermometer. Has a prismatic mercury filled capillary. Super quick temperature indication: Correct and Final temperature within 3½ minutes. 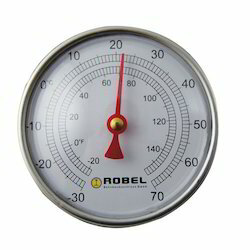 Our organization is indulged in offering Rail Thermometer to our clients. - Pocket size and time tested rugged thermometer. - Has a prismatic mercury filled capillary. - Double metal housing for safety in transit & storage. - Magnet does not get demagnetized even at high temperatures. - Conforms to NPL & RDSO standards.